The bodywork consisted from a wooden frame on which a shell made from bent sheet metal was fixed by nails. The rear was rounded, contrary to the twoseater (similar to T3-1). The car also has only one door which is located on the passenger side and which opens to the front. Vice versa on the rhd cars. The door size was increased by 12cm in respect of the previous models (T2 and T3-2). The doorhinges were therefore reinforced and mounted invisibly. A tensioned conical bolt reduced undesired vibrations. The spare wheel was fitted on the car's boot and equipped with a tyre upon delivery. In the front there are two single seats, covered by black skai. 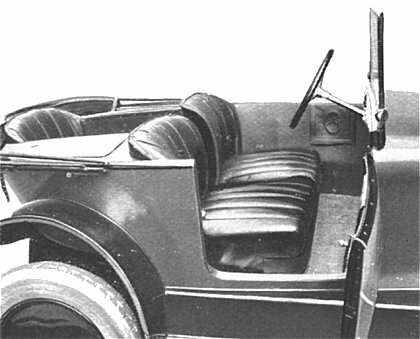 The third seat is in the middle of the rear part. A space between the front seatrests gives easily access. Two luggage compartments were situated on either side of the rear seat. They are accessible from top and close with a lid. The running boards are made from aluminium, reinforced by longitudinal ribs. They are black painted, the higher ribs are polished. Wings and frame cover are made from black enamelled sheet metal. All four wings are reinforced by bordures. The sidepanels were provided with pockets. The interior (incl. seats) was also available in black, red and brown. The floor was covered by a black brush-carpet. The dashboard is from aluminium, tap-ground and equipped with the most important instruments. 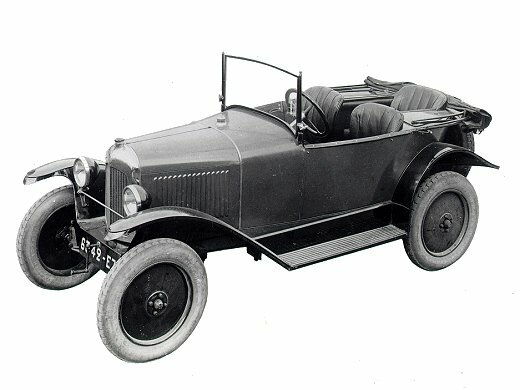 The Model T3-2 is basing on a chassis C3 with a wheelbase of 2.35 m. The running board from Aluminium is 170x980 mm. The windscreen can be inclined and fixed in any position. The pivoting point is in the lower third of the columns. The hood is fixed on a single shaft and covered by waterresistant fabric. The folding mechanism is made from steel. All cars were equipped with Michelin "Confort" balloon tyres (715x115) and the corresponding rims. The rims were manufactured by Michelin and delivered complete with tyre to the assembly line. 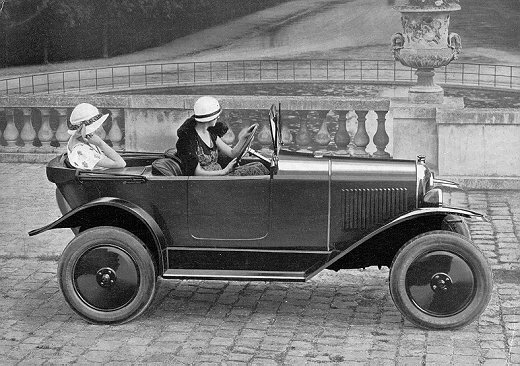 From autumn 1925 on the Trèfle was equipped with round mudguards and with a new, oval rear axle. 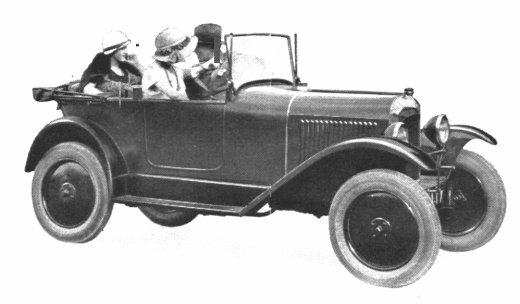 The by Michelin developed drop-centre rims (Bibendum, 12x45) were available only from 1927 on and substituted then the beaded-edge rims of the still running vehicles. At its introduction the Trèfle was available only in mousegrey (beige foncé) [L179]. From December on this model was offered also in blue and burgundy. The mousegrey colour apparently was not favourised, so that this colour was soon substituted by brown (havane). Rims, mudguards, lamps etc. continue to be black. Black enamel mudguards, frame cover, rims, windscreen frame, windscreen columns, license plate, cover rail. Mousegrey, burgundy red (marroon), blue or brown (havane) bodywork, bonnet. Black, red and brown skai Seat, seatrest, side panels, pockets. Nickel plated radiator shell, headlamp rims, lamps connecting rod, steering column, fuel tank cover,rail behind bonnet, bonnet locks.